The Rotary Egg Beater, was a staple kitchen tool, until the electric beater came along. Hand powered kitchen tools gave your arm, shoulder and fingers a workout. Now, all you need to do is hold an electric beater in your hand while it does all the work. Or you can watch a blender, crush, mix and frappe without much effort on your part. Before the advent of electric kitchen appliances, everyone used kitchen tools that were powered by elbow grease. Electrically powered blenders, food processors, peelers, mixers, make food preparation fast and easy. Hand powered kitchen tools provide exercise for your wrists, fingers, and arms. In a weather emergency you may lose power. Electrical appliances won’t work. Grocery stores will be closed. Be prepared to use other methods to prepare food, open cans, and to keep perishable food cold. Remember this: when you don’t have power, and the grocery stores are not open, you can still eat healthy, but more simply. You have to plan ahead for those emergencies. Make The Rotary Egg Beater, a staple kitchen tool in your home. When the power goes out, you can have your shake, and drink it too. The more you add, the thicker your shake. 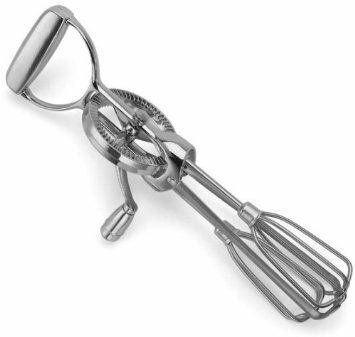 Kitchen Tools: Fork or Potato Masher, Rotary Egg Beater, Measuring Cup, Mixing Bowl. Directions: Mash banana with fork or potato masher in mixing bowl, until creamy. Add milk. Blend ingredients with rotary egg beater until smooth. Dried fruit juice powders come in many flavors: strawberry, blueberry, banana, acai, pomegranate. Adding a banana to your shake will make it thicker. Be sure your powdered fruit juice is compatible with the flavor of a banana. The more bananas you add, the thicker the shake. Directions: If using a banana, mash with a fork or potato masher until creamy. Pour milk into mixing bowl, add fruit drink powder. Blend ingredients with rotary egg beater until smooth. You can start off by browsing at Amazon, where you’ll find a wide selection of manual rotary egg beaters, at various prices. The one picture in the photograph at the top of this post is the Danesco 12-Inch Rotary Egg Beater . Just click on the link to get there. Posted on November 10, 2012, in Food, Off The Grid, Recipes, Recommended Products, Weather Disasters and Health and tagged non-electric kitchen tools, retro kitchen tools, rotary egg beater milkshake, weather disasters and health. Bookmark the permalink. 1 Comment. I love looking through a post that makes men and women think.